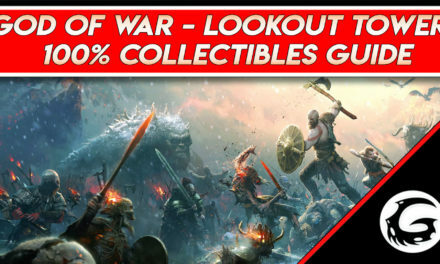 This title was reviewed on PS4. The long-awaited arrival of the web-slinging hero on PS4 has finally arrived putting players in the suit of Spider-Man. 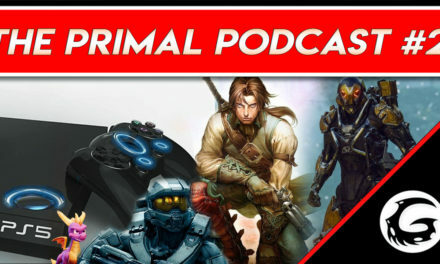 Marvel’s Spider-Man, released September 7, 2018, and developed by Insomniac Games, has been making its rounds on the hype train since its initial announcement and further showcases at E3 and PAX West. With a comic accurate recreation of Manhattan and an all-star lineup of villains, this iteration of Spider-Man has a lot to live up to for the anticipation it has generated. Let’s take a look and see if Marvel’s Spider-Man lives up to the expectation. The story begins with our hero Peter Parker waking up late for work, panicking to get ready quick and diving straight into the action. Players are introduced almost immediately to Captain Yuri Watanabe who is Spider-Man’s link into the goings on of the NYPD and hotline for crimes throughout the city. The main plot continues with Peter meeting up with Otto Octavius of Octavius Industries, where he works as a scientist to help develop methods of limb replacement for disabled citizens. Throughout the story, Peter and Otto slowly make breakthroughs in their research, before Mayor Norman Osborn shuts down their funding and seizes all research assets. This does not sit well with Octavius and he begins to desperately invent something new to maintain control of his company. Meanwhile, Spider-Man has his own troubles to deal with. Players are first introduced to Shocker, a supervillain who seems to have been hired by someone he fears to steal money for an unknown party. After being thwarted and sent to the Raft, a high-security prison built in the water outside of New York, Spider-Man begins to uncover clues to the true mastermind behind the crimes, Mister Negative who wants revenge on the Mayor for an unknown purpose. Throughout the story, Spider-Man faces the armies of Mister Negative and the other rogues of the Sinister Six, Vulture, Rhino, Scorpion and Dr. Octopus. With the help of his ex-girlfriend Mary Jane Watson and new friend Miles Morales, Spider-Man uncovers the revenge plot to destroy Mayor Osborn over an experiment gone wrong. While the story of the game does not give players a unique narrative, it hits all the notes of a great comic book plot. A diverse cast of characters and a great rogues gallery make this feel like you are sucked right into the world of a superhero. While the majority of the story moves at a quick action-packed pace, there are several times where players take control of Mary Jane or Miles to stealth through an enemy area to retrieve an item or information. During these segments, the pace of the game grinds to a staggering halt. While the majority of the missions and side quests for Spider-Man are fast paced and action packed, these stealth missions just make you want to get through them as quick as possible to swing back into action. Even though these plot points are relevant to the story they just feel like they don’t belong. When playing a Spider-Man game the first question on everyone’s mind is “How is the web swinging?” and in this game, it’s absolutely fantastic. Swinging from building to building comes easily after only a few minutes of play and the actual web-swinging has a small basis in reality where Spider-Man can only swing as high as the tallest building in the area. A good example of this is when traversing through Central Park where there are no buildings around, Spider-Man swings off the trees in the area and cannot go much higher than the tops of the foliage. 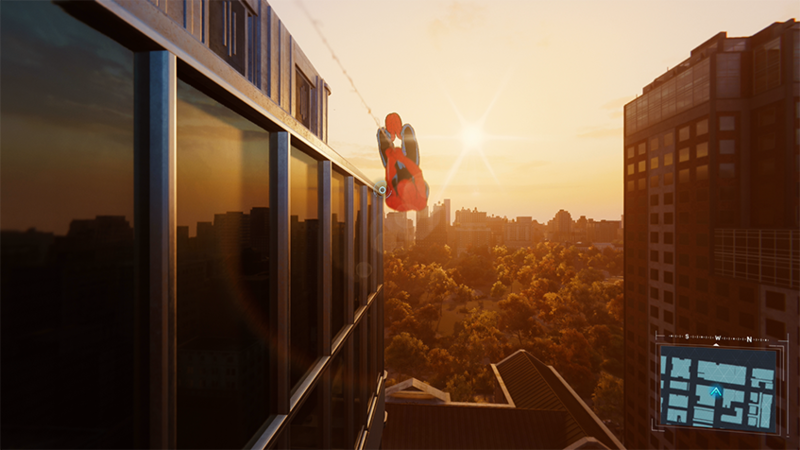 While swinging through the city transitions between swings are smooth with the option to change trajectory and speed on the fly. The whole package feels so right while playing the web-slinging hero, but this isn’t the only way to traverse the city. Spider-Man can give himself a boost with small web bursts to pick up speed and skip off of the tops of buildings quickly by jumping from pillar to pillar or corner to corner giving himself a small boost when the player hits X when he makes contact with the surface. The movement system is simple, intuitive and a whole lot of fun. If players do get tired of flinging themselves around the city, fast travel is always an option, traveling between landmarks on the overworld map. If players have spent any time with the Arkham games, the combat system will seem very familiar. Combat is split between various combos using the square and triangle buttons in combination with web gadgets that players will pick up throughout the story. Different enemies require different combo variations to take down and there are ariel combos when knocking enemies into the air as well. Transition between targets is smooth, and Spider-Man’s spidey sense helps players easily dodge incoming attacks when prompted. While smooth and easy to pick up, the combat with ground level enemies does get repetitive after a while. This can be curbed by unlocking new skills and combos to add on to existing ones but the novelty will only last for a little bit before it begins to feel stale again. One of the tent poles that the game was marketed on was the inclusion of the Sinister Six, the rogues gallery of the game. These boss fights are sadly underwhelming. 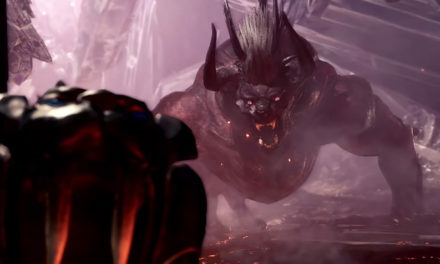 During these fights, players will use a combination of the usual combat mechanics as well as prompted quicktime events that occur when certain conditions are met. The fights seem really lackluster and are over too quickly which is a shame considering how much detail was put into the character models, movements and personalities for the villains. Having more mechanics and actual meaningful combat during these encounters would have made the feeling of being a superhero that much more impactful and not take players out of the game so much. With that said, even though the fights are short and not as player heavy, the effects of each villain look amazing and the quick pace is exiting while it lasts showing the potential that the fights could have. Marvel’s Spider-Man is confined to Manhattan Island in New York City and it’s easy to tell the amount of love that was put into making the city look fantastic and feel alive. 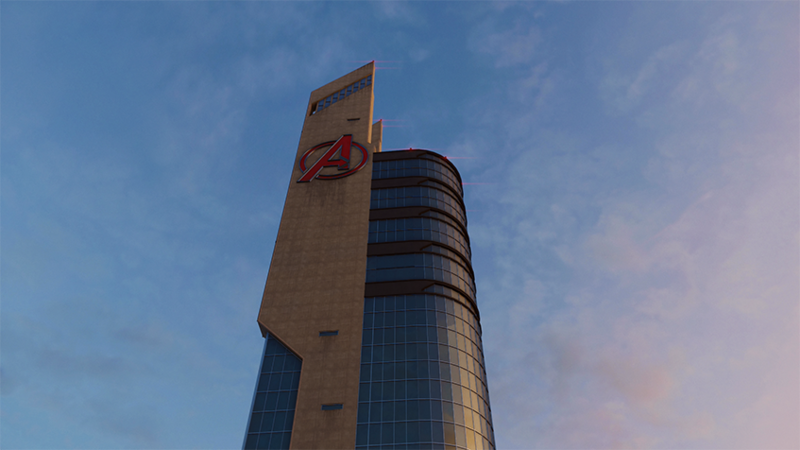 Each district of the city has a different feeling to it and all over players can find nods to the comic book version of the city that was built such as the massive Avengers Tower and the more discreet Alias Investigations. The open world is filled with crowded streets of people walking around and doing small activities adding to the feeling of a breathing city. There are many small details clearly added to rooftops like small pipes coming out of buildings clearly made for Spider-Man’s traversal of the city but everything feels organic. While there is no timed day/night cycle in the game players will experience the city during the time of day when the current story mission is taking place. 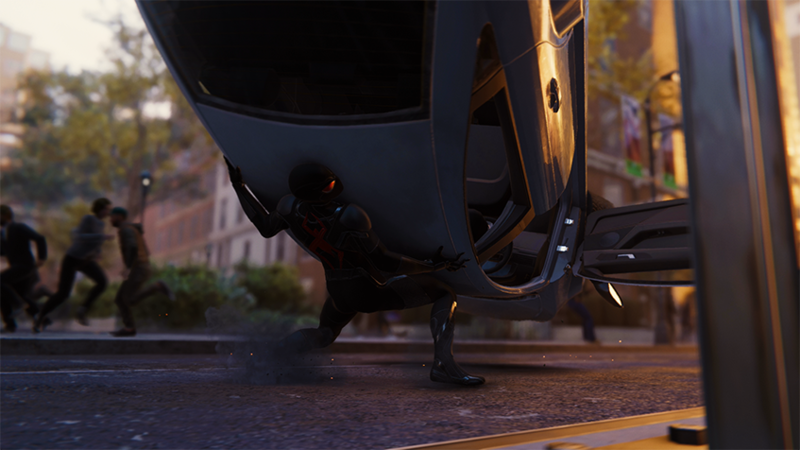 When not swinging through the city at high speeds, some of the missing details are easier to notice but they are things you would expect in an open world such as solid bushes and reused character models for civilians. The enemies of the game are where this stands out the most. Player’s will be fighting their way through four different factions throughout their progress and while each faction is unique players will be fighting through copy paste versions of the same mob over and over again. Even with this minor complaints, exploring the city never feels dull and there is always something new to discover. For the most part, Marvel’s Spider-Man performs exactly how it should. Smooth traveling and motion, fast paced combat and the occasional QTE or two. However, there were some points where the game did have some frustrating situations. Every now and then an enemy that had been knocked away in some way would end up inside of a wall or a pile of boxes and the only way to defeat them was to attempt to hug the area and throw a few combos. 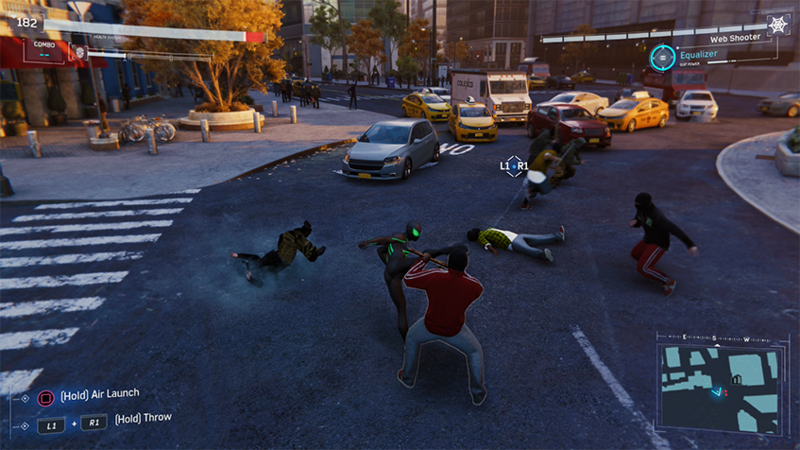 Once or twice when multiple enemies attacked at once and pinned down Spider-Man, the camera was suddenly below the city for a moment before coming back up to normal. Last, and probably the most annoying, was several times when Spider-Man stuck to a wall without running or swinging off he just didn’t want to jump off of it no matter how many buttons were pressed even when just a foot or two off of the ground. The game is very noticeably meant to be played in the open world where high mobility is always an option so when certain areas confined Spidey into a warehouse or lobby these issues seemed to rarely pop up and it seemed as though the AI became a bit confused. That being said, these issues only occured a handful of times during an almost 25 hour playthrough and never broke the game entirely. Marvel’s Spider-Man delivers on what was promised, an open world adventure where you take control of one of the most iconic superheroes of all time. 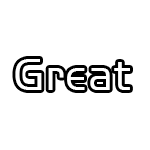 The gameplay is solid and the world is well crafted and feels lived in. The story is well written and really captures a comic book plot in a way we haven’t seen in a while. That being said, the boss battles with the iconic villains of the franchise fall short and leave you wanting more of what could clearly be truly epic. Hopefully with the upcoming DLC in October players will see more fleshed out villian encounters that don’t feel rushed as a side note to the main plot. The most important thing about Marvel’s Spider-Man? It is an absolute blast to play. Swinging around as the web slinging hero feels so right and precise, and the characters personality and humor is captured straight out of a comic panel. Even the many collectables and random encounters never feel like work to complete because traversing the city is so enjoyable. 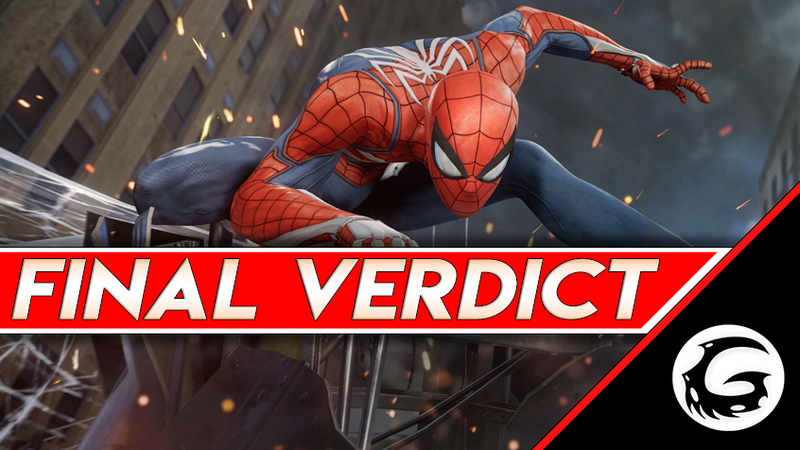 Our final verdict for Marvel’s Spider-Man is an eight out of ten.